On the 30th of March 1818, one of the founding fathers of the co-operative banking movement in Europe was born: Friedrich Wilhelm Raiffeisen (1818-1888). Raiffeisen’s 200th birthday offers a good opportunity to put the spotlights on the specificities of the co-operative banking model in present times. 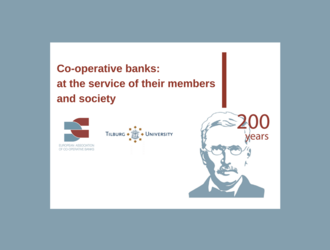 We start this contribution with a concise description of the differentiating characteristics of co-operative banks. Subsequently, we pay attention to the evolution of members, number of co-operative banks, branches and employees. The following sections present domestic market shares, balance sheet developments and a number of financial performance indicators. To put the performance of co-operative banks into perspective, their indicators are compared to those of the entire banking sector. Needless to say that bank performance cannot be judged solely by financial aspects, but a comparative assessment of non-financial performance indicators – like customer satisfaction, sustainability, etcetera – is beyond the scope of this contribution. The main conclusions are summarised below. The banking sector incorporates a rich array of banks with diverse business models and ownership structures. Public, state, savings, co-operative, mutual and private banks co-exist in a diversified market. In policy reports and research publications, a particular distinction is made between Stakeholder Value (STV) banks (of which co-operative banks are a major component) and Shareholder Value (SHV) banks (of which listed banks are a major component). The distinction is ultimately about the banks’ bottom line objectives and the extent to which profit maximisation is the central focus of their business models. STV banks can be categorised as ‘dual-bottom line’ institutions, i.e. they aim at both financial/economic goals and social objectives. Co-operative banks share many basic principles, which sets them apart from banks with other organisational forms. All testimonials of co-operative banking groups in Part 2 of this publication clearly underline these differences. For example, co-operative banks are owned by members who are also customers of the bank and have equal voting power, do not aim at profit maximalisation, have multiple goals, apply a bottom-up decision making process, build their capital base primarily with retained earnings, and have an internal guarantee mechanism (e.g. an institutional protection scheme), etcetera. At the same time, differences exist in the practical way of operation in many other areas. There is a rich diversity in co-operative business models. Co-operative banks differ in size, organisational structures, membership policy, and non-core activities. Across Europe, co-operative banks compete with institutions which have different ownership, governance and capital structures and different business models, i.e. SHV and STV banks. Recent data continue to evidence that the timeless features of co-operative banking have led to different strategic choices and deviating financial outcomes compared to banks with other ownership structures. The findings of the empirical analysis, conducted on a sample of 18 co-operative banking groups over the period 2011-20162, show that governance arrangements are partly responsible for their divergent business performance and, specifically, their ability to finance customers characterised by relatively low credit risks. As a corollary, co-operative banks contribute to diversity and, consequently, stability in banking. This message can never be overstated. Here, we have to emphasize that co-operative banking is neither better nor worse than other banking models. But it is different. Irrespective of the merits and drawbacks of different governance arrangements in co-operative banking and all other sectors in banking, we are convinced that diversity is an invaluable asset. No governance model is unambiguously superior and it needs to reflect the nature and ownership structure of different businesses. Moreover, recent experience in a number of countries demonstrates that diversity can be easily jeopardised, but is very difficult to regenerate. For the sake of a healthy, kaleidoscopic and competitive financial system, we hope that co-operative banking can remain a viable and parallel alternative to all other banking models until the end of time. The word ‘can’ is deliberately typed in italics in the last sentence. Indeed, the expressed expectation is based on the pre-assumption that financial policy makers and regulators avoid applying a regulation tailored to listed banks to co-operative banks as well. On the whole, co-operative banks are neither as risky as joint-stock banks, nor similar in their governance, organization and business practices. At the same time, a differentiated regulatory and supervisory approach is warranted for individual co-operative groups. In sum, we trust that financial regulators and supervisors take into account the specifics of the co-operative banking model when designing, implementing and applying policy measures.